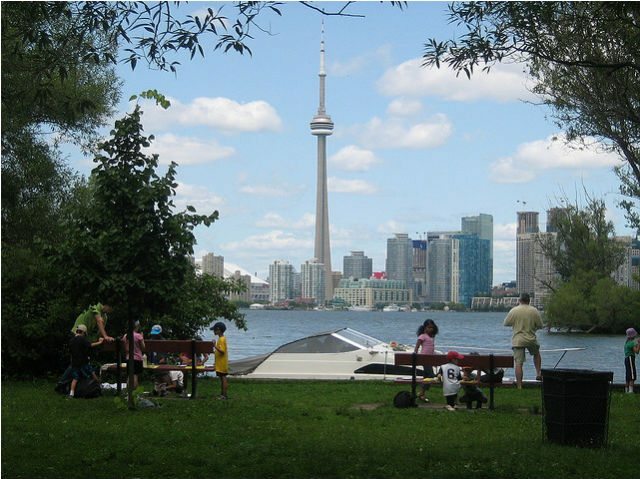 Fantasies of a revitalized, reclaimed central waterfront will one day become realities. I can’t help noticing that the eastern tip of the main runway of the island airport sits dead centre on the north-south axis of Spadina Avenue, a great street in its own right and one of the few of any stature in Toronto that has an actual terminus—that being the old Knox College on Spadina Circle, now under overdue renovation. One of my favourite fantasies while pedalling down Spadina is to imagine what monument might some day rise up on that perfect site, surrounded by the waters of the bay, to mark the southern endpoint of the axis. Any such monument would mark much more than that, of course, both symbolically and politically. That’s what makes the fantasy beguiling: the airport is long gone, the city’s most precious parkland is vastly expanded and accessible like never before, a car-free, Amsterdam-style neighbourhood hugs the southern edge of the Western Gap, and there is one move left to mark what all citizens agree has been a historic turnaround. At the heart of the dream, there is a genius in the heroic mould of New York’s Olmsted or Moses, Los Angeles’ Mulholland or Paris’s Haussmann, a master builder who recognizes the urgent need to modernize the obsolete industrial city by humanizing it—and who brutally steamrolls all those who dare oppose the vision. So naturally, the monument will be grand and cost no object. Indeed, many will be appalled by the extravagance of the gesture. But they will be the same people who said the redevelopment of the airport lands could never work. What happened instead is that the new community—car-free like the rest of the island, and confined to the footprint of the old airport facilities north of the runway—instantly became one of the most desirable residential addresses in Canada. But the biggest revelation is the park, vastly expanded and joined directly to the mainland through a short pedestrian tunnel. Millions stream through in all seasons. Nobody lines up for a ferry. Hanlan’s Beach is almost a kilometre longer, and all the new facilities—pavilions, playing fields, cafes, amusements—are superb. People who barely knew the island existed before the transformation are amazed to discover such a splendid natural resort so close to the bustling city—and suddenly, miraculously, so much a part of it. The applause is universal, the coffers are full with real-estate profits, and the island czar has a free hand to do something truly spectacular with the most valuable site of all—a great symbol of reconnection at the new watery foot of Spadina Avenue. And then I wake up, of course, realizing I will probably be dead by the time such a dream becomes real. But I am certain that some day it will. The improvement is simply too obvious for it not to happen eventually. The tide that is transforming cities throughout the developed world may be weak in Toronto, but it only flows in one direction. Just as the zoning says, the airport is a temporary non-conforming use. And the island is a park. That’s a fact, but you can’t say it out loud if you want to be taken seriously. The last authority to do so was the old Toronto Harbour Commission, which realized its airport was in the wrong place and proposed closing it in the 1970s. But none of the hundreds of plans, commissions, studies, and proposals since then have dared point out the obvious: that the existence of the airport is the biggest impediment to the historic task of reclaiming the central waterfront. Even NoJetsTO, the terrific new group that is currently leading the never-ending battle against airport expansion, dares not go there. Just the opposite: accused by Porter Airlines and its allies of wanting to close down the operation altogether, its leaders insist they have no problem with what they call a “boutique airport” on the site. It’s a smart but sad tactic—and a bit of a puppet show considering how very few Torontonians actually do see the wisdom of bulldozing that runway tomorrow. For the time being, then, we foolish few are fated to emulate the old-fashioned Communists who found reason to join mushy “fellow travellers” on journeys that generally headed in the right direction—even if they disagreed about the ultimate destination. The dialectic is not dead, you see. “Boutique airport” is an obvious contradiction that history will soon expose. The operation is popular because, as Porter’s books have shown, it sells a service for less than the cost of providing it—losing money despite a long record of subsidies, tax breaks, and sweetheart deals with the Toronto Port Authority (the “gravy plane,” as one reader described it). That can’t go on. As Porter’s propaganda acknowledges, however inadvertently, the airport must grow or die. Ergo, keeping jets out kills it off. The problem is that there’s no rallying cry in that. There’s no vision at all, just an insistent, smothering nyet. Nothing will really change until more people open their eyes to a positive vision of what the central waterfront—the very face of the city—might some day be. We can only dream today, but the exercise is no less necessary for that.